A new creature has been teased! I like it, but I gotta say, Alex Ries is rather fond of making creatures that look cute until they open their mouths, and then they’re nightmare fuel. One thing about this puzzles me, though. I expected the Pinnicarid would be the standard aggressive shark creature for the Arctic more or less, but the squidshark has clearly taken that role, so what will the pinnicarid do? I could see them being the Rabbitrays of the arctic, or maybe they’re neutral and only attack if you attack them first. And maybe my theory will be correct and they ARE the 4546B equivalent of seals. why not give it three legs and call it a night. And we’ve got a new design for the alien penguin! Not much has changed besides the color and the addition of big ugly nostrils, but I’m definitely gonna miss the previous design. I can understand why they changed the color though, the previous design was remarkably similar to earth penguins. 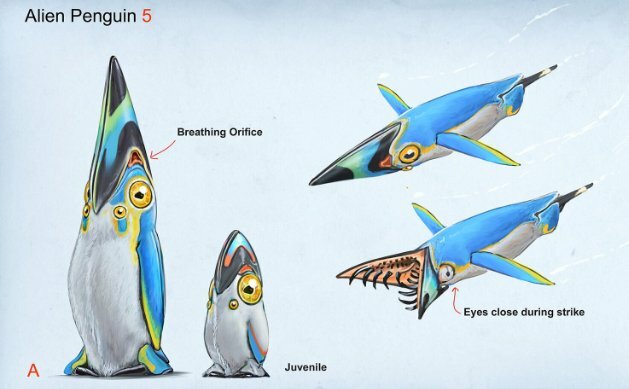 I’m hoping the color change means we get pinnicarid C (who has a similar color scheme to the previous alien penguin) which is my favorite by far. So it went went ultra instinct super puncher blue? Firstly, we have a regular old iceberg zone. This is probably the standard biome (our safe shallows maybe?) 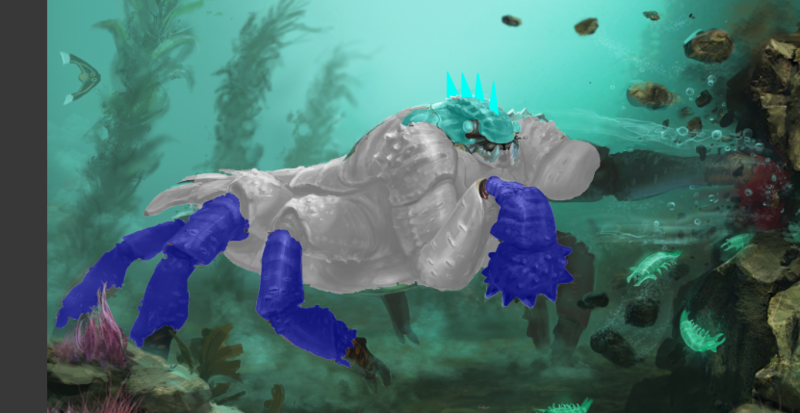 but most interestingly, there is a leviathan class animal in the water. I’m excited to see what the whole thing looks like! One other thing: This art confirms that the regular PRAWN is coming back. TWISTY BRIDGES CONFIRMED!!! Super excited about this one. I like the changes they made, except that it’s now deeper. I think that the flora changes more than compensate, however. I’ll be happy as a crashfish if I can grow those giant maroon sea apples in growbeds. No sign of the pink lizard dude, so he might’ve been cut, which is sad. 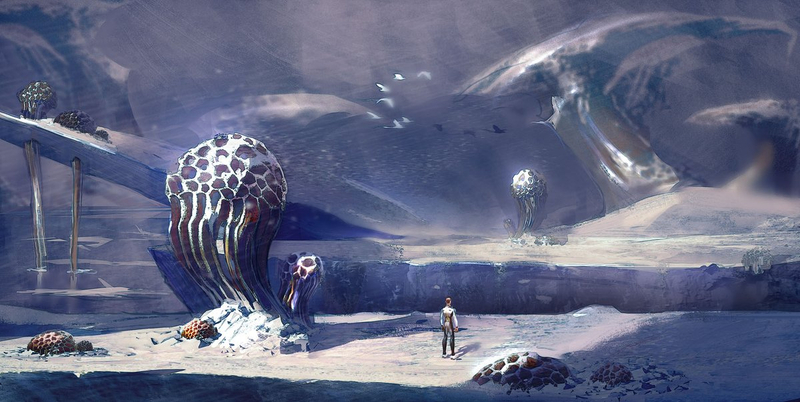 Would anyone be fine if whoever is behind the concept art kept drawing different biomes/ creatures that could exist in other parts of the subnautica world? I’m sad that once the game is done, we won’t see any new concept art, unless a fan drew it. 1, there’s a Cyclops. 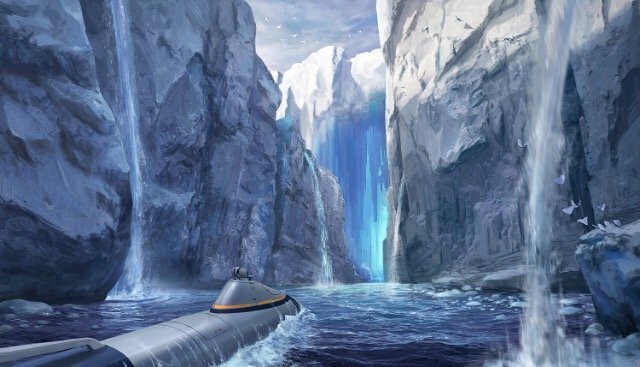 This could mean that we won’t be getting a new cyclops-size submersible. It’s a shame, but it could also mean they HAVE figured out something a new vehicle could provide. I expect it’ll be the Hovercraft the devs have been toying around with. 2, Skyrays return. This doesn’t mean much except that it provides more evidence to my theory that alien penguins are big fat land skyrays. Wow, it's gonna be a nice looking game! I wonder if they'll make a dynamic landscape - with moving bergs, ravines that open and close etc. I personnaly think they won't because subnautica as always been a very "stable" game when we are talking about it's environement. Plus I think this would get us (or at least me) confused about where we are going since it would never actually be the exact same place. Indeed 100% of Subnautica games so far! Soz Snoutchi, I thimk whatever they come up with is likely to be pretty engaging. Yeah, I'm pretty sure it will be! You have lost your mind if you think that I want something like that it was terrifying enough going through the ILZ but now your adding something that is going to be there all the time, nah uh. 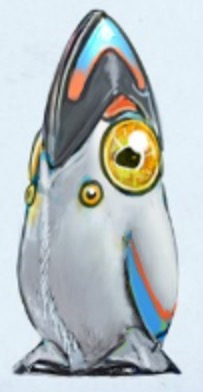 But they might be like the crash fish of the dlc. Like the only thing to be scared of in the SS but for the dlc? That mouth doesn't look that good for biting into anything large. They're hooked and inward-facing for keeping small prey from escaping; and once more, in order for the beak to close entirely, the teeth would need to fold inwards. This would also allow the pingu to draw small prey towards its gullet without a tongue like fish (check out the freshwater eel for example). However, if that is a beak, the player will likely experience a number of well-aimed bludgeoning missile strikes from extremely hydrodynamic and person-sized territorial sources. Imagine that. Something to note about this design is how there are two different sets of teeth. Not that this is very strange in most terrestrial creatures but how this creature's teeth sets are reflected. Specifically, on one jaw, it has its small little jagged slashers next to its long spiky harpoons. On the other jaw, the spiky harpoons are across from the other side's jagged slicers and vice versa. Now I don't know exactly how unlikely it is that a species evolve to be this asymmetrical (as even the flounders are sideways and not criss-crossed), but I know that as far as I know, no species on earth have such screwed up physiology. I just hope that it isn't product of the precursors screwing around with genetics and frankenstienology. Something else is the muddled countershading. It does have counter-shading, but the top is blue rather than black like it is on earth; which makes sense since the water in subnautica is much clearer than earth's and so I guess that it might reflect the sky better. Although this might also mean that 4546B's oceans are relatively shallow compared to our own. Who knows. But as for the green and orange bits, this might suggest that the pingus range from multiple climates; from freezing cold to tropical twisty bridges and reefs. Maybe the waters are full of luminescent pho and zoo plankton which glow green and orange- which would be pretty cool. 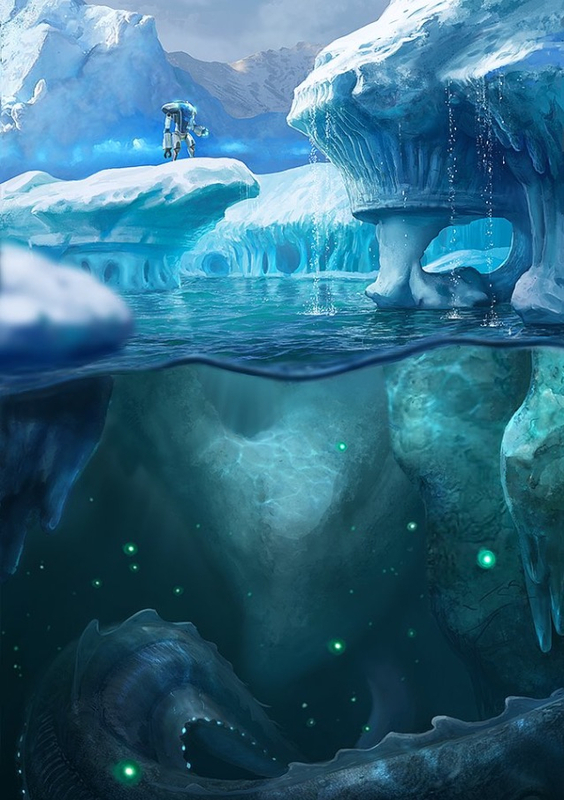 Also, the pingu looks kinda' like the Subnautica concept art which I can never seem to find a valid image link for. You know, the one with the orange submarine fleeing from the giant snaggletooth monster. Actually if you read what Obraxis posted along side that image, you'd see that the Cyclops has actually been deconfirmed and probably won't be appearing in the expansion. Hey @Morph_Guy got a link to that post? Oh! I get the art from the wiki so I don’t see the developer statements. Good to hear we might get a new large submarine! I imagine that the asymmetrical teeth is just because its concept art and doesn’t need to be perfect. It’ll probably be corrected later in development. You’re probably right on both points. 4546B has far shallower oceans than earth (aside from the Void) and this combined with the perfectly clear seas we see in most cases makes blue countershading more viable. The stripes are probably EXACTLY what you suggested, camouflage in colorful reefs. We don’t know what underwater looks like where they spawn so it could be rather lush. does anyone else see the resemblance between the squid shark and those unnamed creatures that were supposed to be for the coral/rapid currents zone? Hahaha do you have a fixation on these freaking spike traps? Hahaha do you have a fixation on these freaking spoke traps? I kinda just wanted to talk about them and yeah their bigger then the player I had a mini heart attack when I saw it. Of what 'spike trap' do you speak?